The button: an object seen by Simonetta Starrabba as everything that is not. It does not fasten, close, open, but is affectionately brazen, greedily arrogant, absolutely immodest, a challenge and quest for harmony in forms and colours. 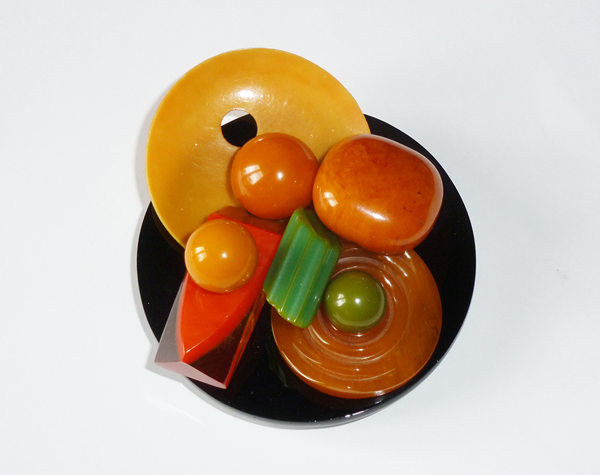 Materials that attract each other, colours that go looking for one another, little tales of mother-of-pearls, galalith, bakelite, vague complicities of celluloid, glass, and horn. It becomes a game, unleashes hunger, thirst, tenderness: it is uncomfortable, noisy, tactile, and indiscrete. It has become a jewel. Hunting for vintage buttons ever since, she searches for these fantastic little objects anywhere from collector stores to flea markets, keeping a special preference for those from 1920’s to 1940’s as they are always different and full of smart details. 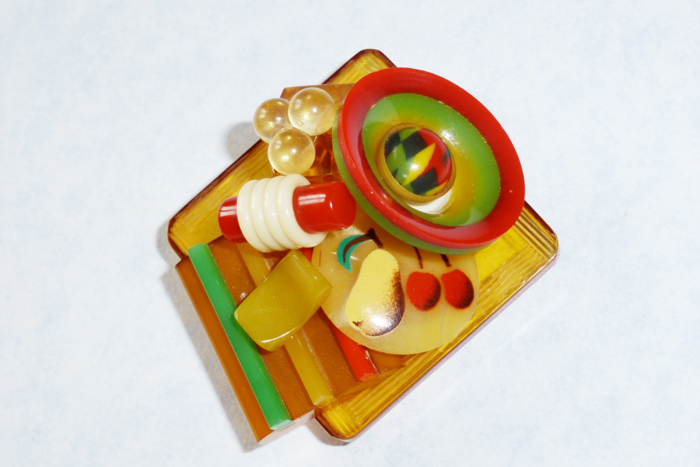 These buttons are usually made from bakelite, casein, celluloid, all kind of plastics, glass, bone, wood or crystal. 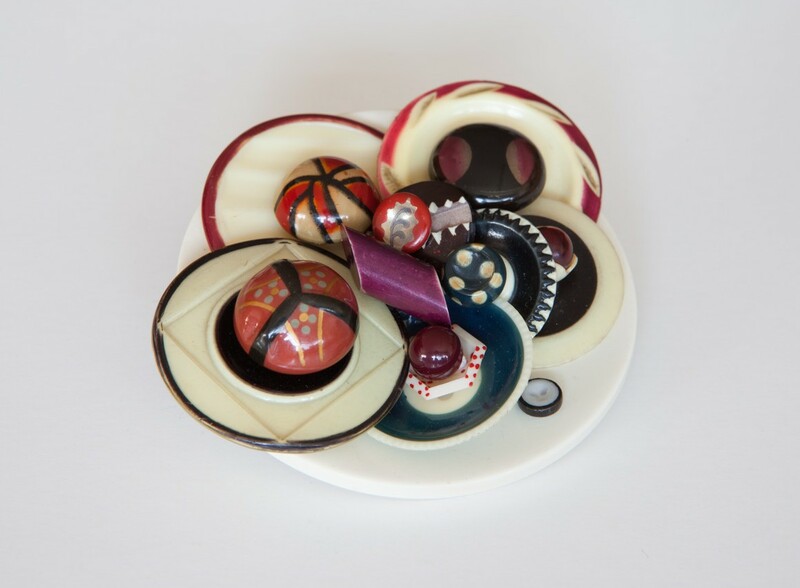 In her designs she tries to find harmony between forms and tones as she sews different buttons together, fashioning her jewelry just like a child playing Lego. Starrabba’s constructions are charming and marvelous, yet serious and intriguing. Her jewelry: bracelets, brooches, earrings, rings and cufflinks are all unique pieces, they have been sold all over the world, also in London, Tokyo and New York. 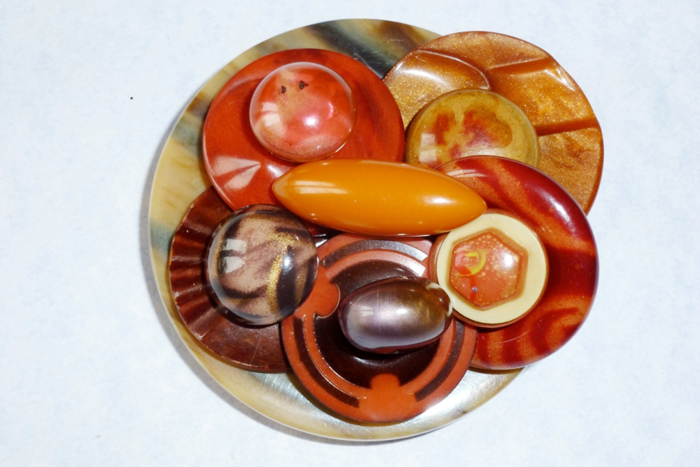 Simonetta Starrabba is a member of National Button Society since more than 20 years. She took part in many exhibitions in Italy and abroad (among others, Loot at MAD Museum in New York amd Alternatives Gallery in Rome). Il bottone: un oggetto visto da Simonetta Starrabba in tutto ciò che non è. Non allaccia, non chiude, non apre, ma affettuosamente sfrontato, golosamente arrogante, assolutamente immodesto sfida e ricerca l’armonia tra forma e colore. Materiali che si attraggono, colori che si cercano, piccole storie di madreperla, galalite, bachelite, vaghe complicità di celluloide, vetro e corno. Diventa un gioco, scatena fame, sete e tenerezza; è scomodo, rumoroso, tattile e indiscreto. E’ diventato gioiello. Incessante è la ricerca della materia prima, i bottoni d’epoca, tra modiste, collezionisti, mercati, soffitte e aste di antiquariato e modernariato. I gioielli di Simonetta, tutti rigorosamente pezzi unici creati personalmente, nel corso degli anni sono stati esposti nelle vetrine di negozi famosi in tutto il mondo, tra l’altro a Londra, New York e Tokyo. E’ iscritta alla National Button Society (USA) da più di vent’anni.